This paper follows our previous study of forced non-solid-body rotating turbulence and summarises results on the eddy size and lifetime in the same flow. The experiment is conducted in a dodecagonal tank ($R_t\approx1\, m$ in radius and $2\,m$ in height) and the bulk rotation is onset by the co-rotation of two circular impellers installed on the top and the bottom of the tank. 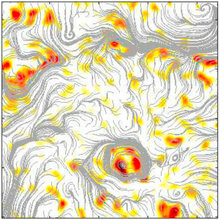 Turbulence is continuously injected to the central region mainly from the vertical baffles installed on the tank wall. As the impellers rotate in a steady manner, the global Reynolds number ($Re_G$) and Rossby number ($Ro_G$) sustain in the range of $350\sim5900$ and $1.44\sim3.35$ respectively. Two-dimensional particle image velocimetry (2D PIV) measurements are carried out in a plane normal to the axis of the rotation and in the central region of the tank, where the flow is found Rayleigh stable. By developing an eddy detection and a lifetime estimation algorithm, we show that there seems to be a characteristic eddy size $d^\ast$, which is about $0.08\sim 0.1R_t$ and is weakly dependent on $Re_G$. Among eddies which are smaller than $d^\ast$, anti-cyclonic ones are dominant, but only marginally, while for eddies larger than $d^\ast$, prevalence of cyclonic eddies is evident in both number density and lifetime. The demarcation eddy size $d^*$ corresponds to approximately constant values of macro Rossby number $Ro^*\approx2$ and micro Rossby number $Ro^*_\omega\approx8$ at high $Re$. This is consistent with the case of solid-body rotating turbulence and indicates that the cyclonic prevalence is here also due to the centrifugal instability, which preferentially depletes anti-cyclones at $Ro\sim1$. On average, the longest lived eddies are found to be of $d\approx1\sim1.5d^*$ and have life spans which are an order of magnitude larger than the turbulence eddy turn over time. The local $Ro$, defined based on the local flow rotation rate and local averaged size of organised cyclonic eddies, is found to be self-adjusted to $2.75\sim3.75$, inside which the maximum extent of cyclonic eddy predominance, measured by the vorticity skewness, is observed. This brings about that the average size of the cyclonic eddies at a given radius is $\langle d\rangle \sim u_r/\Omega_r$ (where $u_r$ and $\Omega_r$ are the local fluctuating velocity and local rotation rate), which is found to be an important scale in this problem.